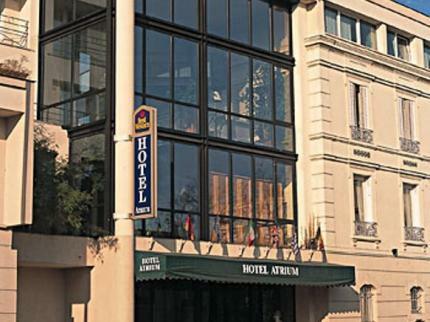 The Best Western Hotel Atrium is 10 minutes from Paris and combines the charm of the capital city with the proximity of La Defense, while offering the welcome and service of a refined atmosphere, that international clientele demand. Comprising of two buildings linked by an atrium, winter garden, lounges with pool, lobby, sauna and a bar, totaling some 250 square meters. All rooms have English style mahogany furniture, are insulated against sound, equipped with satellite television, mini-bar, bathroom and separate water closet.